Head outfit: Teka Paes Brajovic. Felipe Bretas (production), Maria Clara Carneiro Sampaio (research). 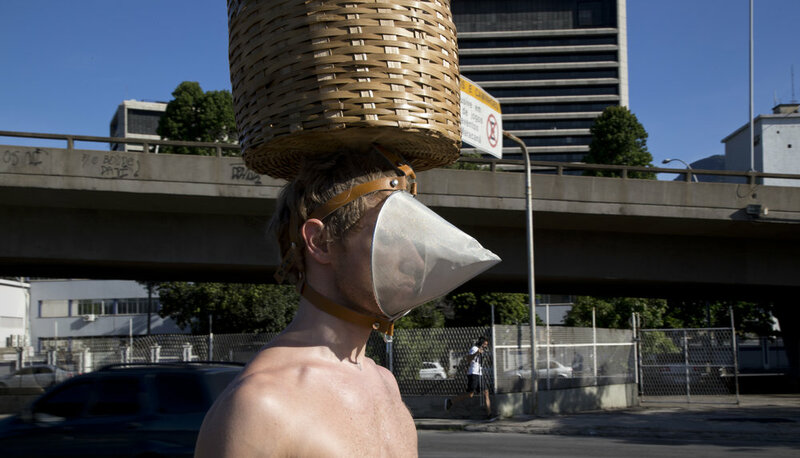 I’m walking down the endless avenidas of Rio with my face covered with the kitchen sieve – repeating the route of so-called ‘tigres’, those slaves who used to carry chamber pots of their owners to the sea – walking through the entire city. 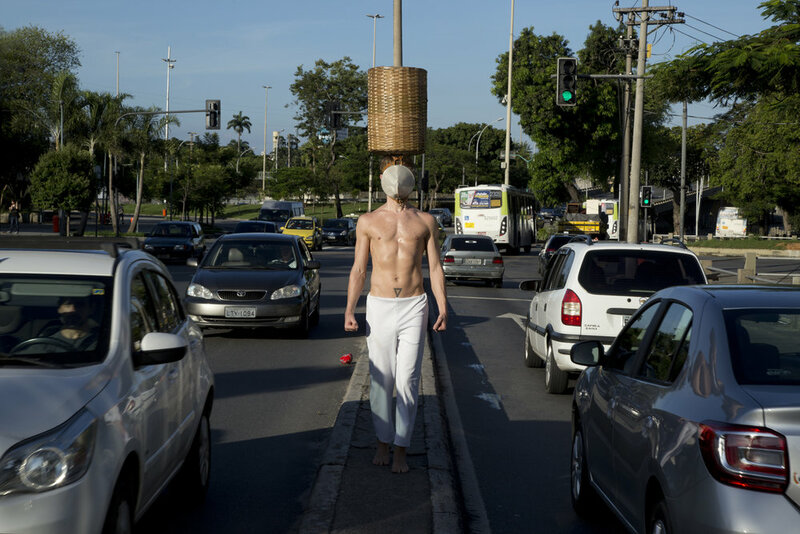 I walk really slowly in order not to wet myself – the basket on my head contains that pot, and it’s shaky. I’m walking ahead trying not to twitch my head. I can barely observe what’s happening around and in front of me, as it’s quite hard to see through the sieve. I have to walk very carefully, lifting up my feet and putting them back on the ground with precise deliberateness. I walk along exactly the same route as the ‘tigres’ used to. Their faces were covered in order to protect them from possible jokes and to avoid an even bigger shame. 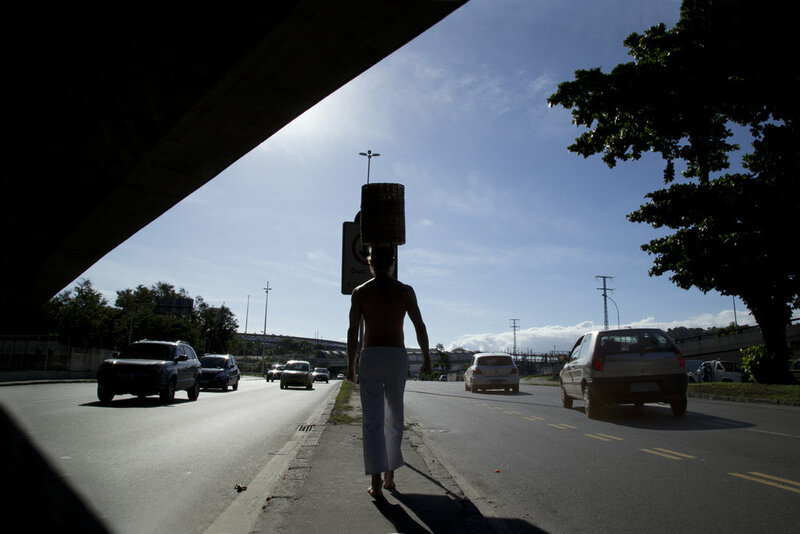 Part of the route goes via Avenida Brasil, one of the most dangerous routes of Rio. It has Favela da Mare on one side and Complexo do Alemao on the other, and both are quite famous for gang warfare; even the police tries to avoid these parts. I walk on the median strip of road that fluctuates from being almost 2 meters wide down to a very tight stripe. At a certain point, I could hear a weird loud bang – later I would learn that 4 cars collided behind my back because one of the drivers lost his focus as he was watching me walk by. My performance ends the moment I reach the sea.